Welcome to April in Dogwood City, a comic book setting rooted in classic and not-so-classic characters from public domain funnybooks. 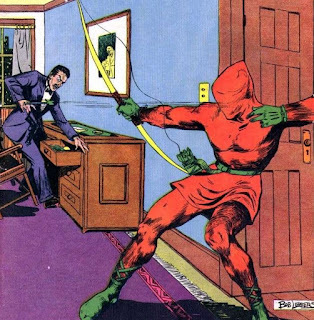 According to his Public Domain Super Heroes entry, the Arrow was "the first costumed comic book hero to appear after the debut of Superman," which is a pretty cool distinction! Special: Trick Arrows - Before an attack, the Arrow can select a trick arrow to fire instead of a standard arrow (1D damage). This can be an explosive arrow (2D damage), a net arrow (no damage, but target must make a saving throw to escape each round before taking further actions), or a flash arrow (1D damage and all characters within 30 feet must save or lose one round of action). Players are also encouraged to create more trick arrows for everyday adventuring! Cool post. My gaming blog started out as a (primarily) superhero rpg focused blog. What system is this? I'm not familiar with it. 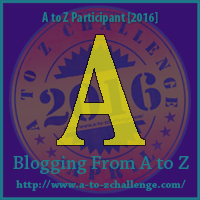 Looking forward to reading more A-Z posts. Thanks for the note! As for the system, it's my own take on a generic presentation for pretty much any old RPG that uses hit dice and a d20 for combat. Now that you mention it, I should probably be a bit more explicit about that. Hmm. Very cool. I love PD supers. They are like a forgotten little treasure. This should be a fun one. Looking forward to seeing what you post all month! Thanks for stopping by! Hope I can post something that catches your eye. I'll enjoy seeing what adventures you pull out this month! Nothing like a good public domain superhero! I'm glad the A to Z could bring you by! Looks like our blogs are cut from the same cloth, by the way. I'll keep up with where you go this month. Nice! I stopped by the Dogwood City link to see what this is about. Really cool. Good luck! Thanks, Deborah! Stop by any time! As someone toying with the idea of creating a goofy superheros webcomic, a look at some Golden Age characters is a good way to get the creativity flowing! Looking forward to seeing more of this series! Agreed, and good luck with the comic. Let me know if you get something going; I always love seeing what folks come up with for these old characters! Really neat. I love this age of pretty random superheroes. I wish I'd been around reading comics back then, rather than the overwrought modern versions. Looking forward to seeing the whole alphabetical line-up. Yeah, the Golden Age was definitely a wilder time in some ways. It's cool that the writers were basically making up the superhero rules at the time, without much in the way of models they felt the need to follow.